So you may have seen a very big dog walking the halls at "The Hill" but don't worry it's just our sweet Baxter. 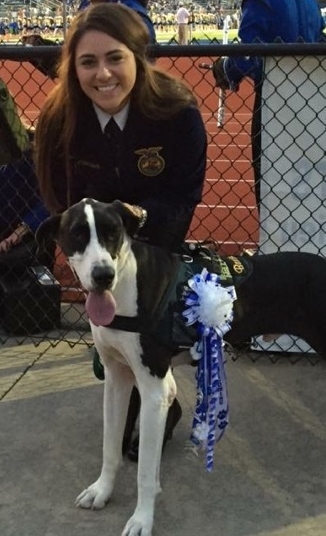 My name is Makenna Castaneda, and I am currently serving as the Barbers Hill FFA chapter's president. But more importantly I am training my best friend Baxter to help others. Baxter is a Great Dane that I have trained and have worked with to help him get his certificate to be a registered therapy dog. That means Baxter gets to visit students and they read to him. And of course he gets lots of love and an occasional snausage (that's his favorite snack). Baxter has learned a few simple commands, such as sit, stay, and lay down. He has also learned what "leave it" means. I am so excited to get to pilot Eagle Paws this year with Baxter. We hope to get more involved with our community and see many of you along the way. Baxter has assisted in many of our home football games in raising the US Flag this year and met a lot of friends on the sidelines. This Blog will be from Baxter and I as his handler will assist him by posting his thoughts. Follow us on this journey, this is just the beginning!